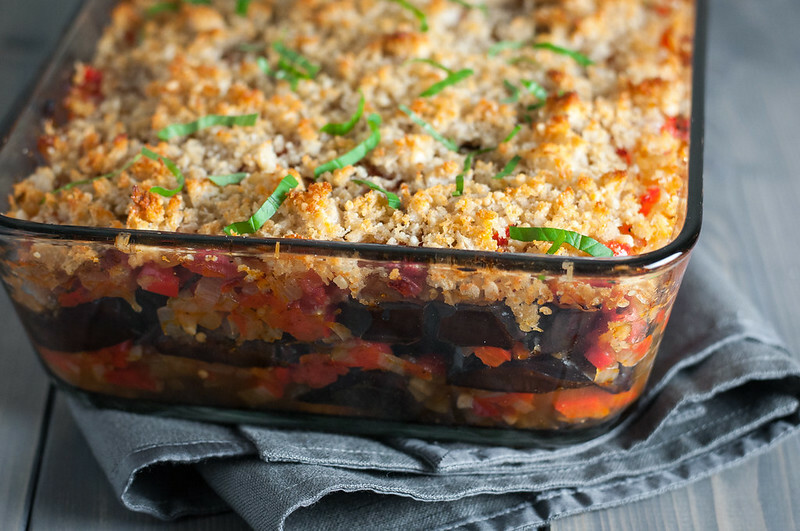 The New Vegetarian Cooking for Everyone titles this recipe “Eggplant and summer vegetable gratin,” but after eating it, it really struck me more as eggplant lasagna. So, I’m going with a happy medium in the ever-challenging recipe naming department: layered Italian eggplant gratin. Another reason I renamed the dish is for my changes–I didn’t want to mislead you into thinking you have to wait (and wait, and wait) for peak tomato season to enjoy this dish. Since it’s only June, and peeling fresh tomatoes is a pain-in-the-you-know-what, I opted for canned, whole, and gloriously peeled tomatoes. It worked out just great, and my final tweaks are included in the recipe. Let me know what you think! When you divvy up steamy stacks of eggplant gratin, the servings really look quite impressive on a plate. They remind me a lot of the polenta pie, another uncharacteristic gratin. Unfortunately, I didn’t get far enough with the photos to showcase this gratin in its total and complete glory. My sister, our last remaining houseguest in town for mine and Steve’s engagement party, was waiting patiently for dinner along with Steve around 9:45 PM. So instead of doing a half hour photo shoot after over an hour of baking time, I worked my angles quickly so we could proceed to chow down. And yes, if you’re wondering, this one is slightly time consuming. However, I’d agree with the original recipe’s author that it is so worth the process. 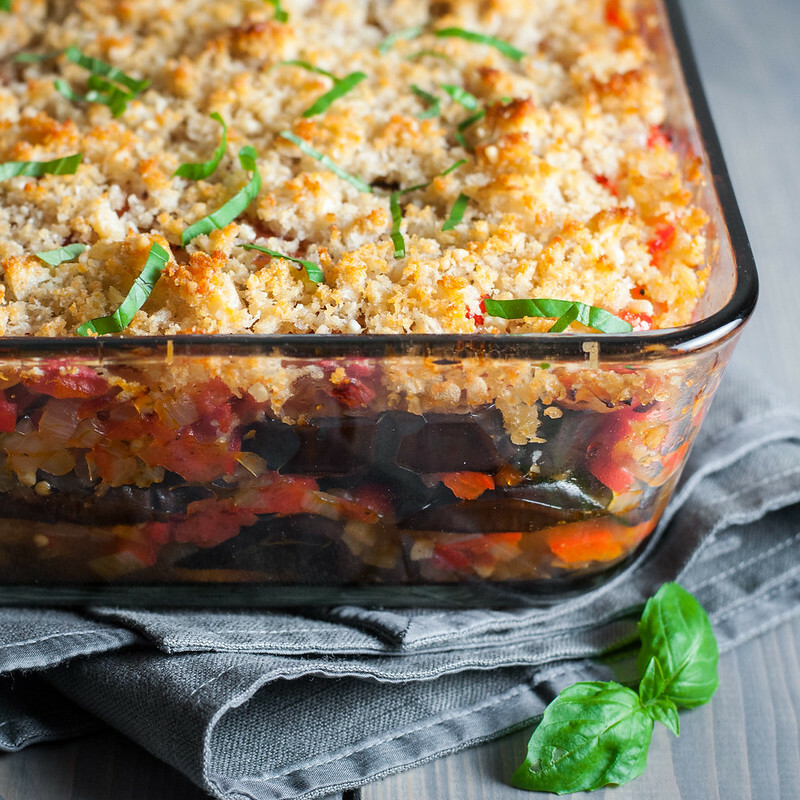 The result of first roasted, then slowly baked eggplant, as well as a gently simmered tomato sauce, is truly creamy eggplant that somehow holds its structure and shape nestled in between layers of tomato and red pepper sauce. Every bite is sweet and rich and flecked with shreds of the fresh basil leaves that have just come into season here. Mouth watering yet? I try not to play favorites with produce seasons, but I have to admit, summer is lookin’ prrr-ettt-y delicious. I pick up my first CSA share on Friday ! You can expect weekly pictures, maybe a new weekly post, lots of recipes for seasonal produce, and a new page to help you find recipes for your own CSA, farmer’s market, or other seasonal produce abundance (I’ll add it to the new announcements section on the blog home page when it’s up). I’ve had ideas swirling around for it in my head all day because I’m a nerd and designing new web pages apparently makes me tick! Friday’s CSA share will reportedly contain some kohlrabi, so I’m canceling my regularly scheduled next gratin (stuffed chiles, also yum) and replacing it with this long awaited dish from the early pages of the chapter. If you want to pamper your eggplant, prepare it like this: sliced and roasted until golden brown, then baked to creamy perfection layered between loads of sweet red pepper and tomato sauce. Preheat oven to 425 (F) and place racks in upper and lower thirds of oven. Slice eggplant ½ inch thick and distribute in a single layer on two rimmed baking sheets. Brush both sides of each slice lightly with olive oil (about 2½ tablespoons total). Bake 10 minutes, then rotate pans between top and bottom oven racks. Roast another 10 to 15 minutes until golden in places. Season with salt and pepper while hot and set aside to cool on baking sheet. Reduce oven to 325 and move top rack just above middle position. Meanwhile, heat 3 tablespoons oil in a large skillet over medium heat. Add onions, garlic, and bell pepper and cook until very soft but not brown, about 8 minutes. Add tomatoes an ¼ cup of reserved juice and bring to a simmer. Cook about 20 minutes until everything is softened, sweet, and most of the excess liquid is reduced. Off heat, stir in basil and season to taste with salt and pepper. Oil or spray a 10 to 12 cup baking dish. Make a layer on the bottom of one third of the eggplant slices, then cover with a third of the tomato sauce, followed by half the goat cheese. Repeat twice, ending with a layer of tomato sauce. Cover and bake 45 minutes. 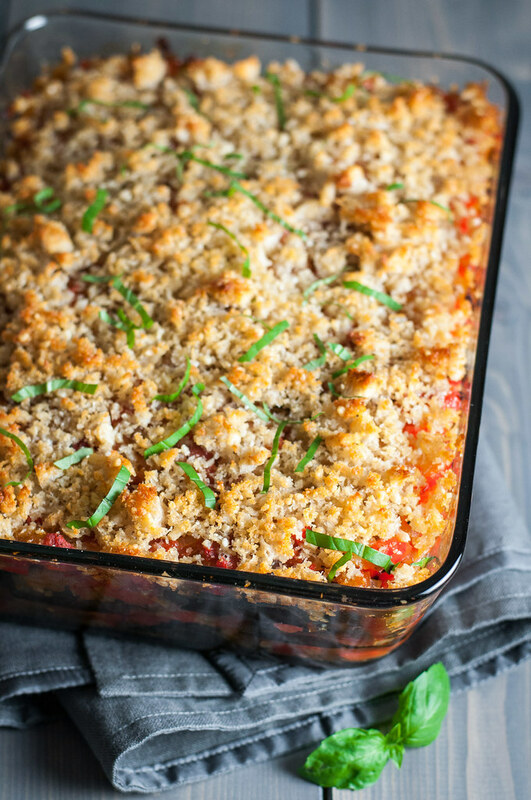 As gratin bakes, combine bread crumbs, parmesan, a little pepper, and a tablespoon of oil and stir to combine thoroughly. After baking time is up, increase oven to 375. Uncover gratin, top with the breadcrumb mixture, and bake another 20 minutes, or until top is golden brown. Cool slightly before slicing and serving with more fresh basil, parmesan, and black pepper. Keeps very well, and is maybe even better as leftovers! I purchased my eggplant in June (in the U.S.) and did not salt the slices, without any flavor issues. I rarely salt eggplant slices in my cooking, regardless of the time of year, and I've never noticed a bitter flavor. If you anticipate an issue, you can salt the slices on both sides, then lay them on towels or place them in a strainer for up to an hour, releasing excess moisture and any bitterness with it. When working with canned whole tomatoes, I squeeze them gently before chopping to remove seeds and juices inside each tomato. Make the recipe gluten-free by using gluten-free bread for the breadcrumbs. Make it vegan by omitting both types of cheese. Recipe is vegetarian as written. Adapted from The New Vegetarian Cooking for Everyone. I love lasagna, and this looks like a great healthful alternative. Thanks of posting this glorious recipe ;) !